GigMasters members fall into one of two camps: Those that are working their way up to a five star rating and those working hard to maintain one. 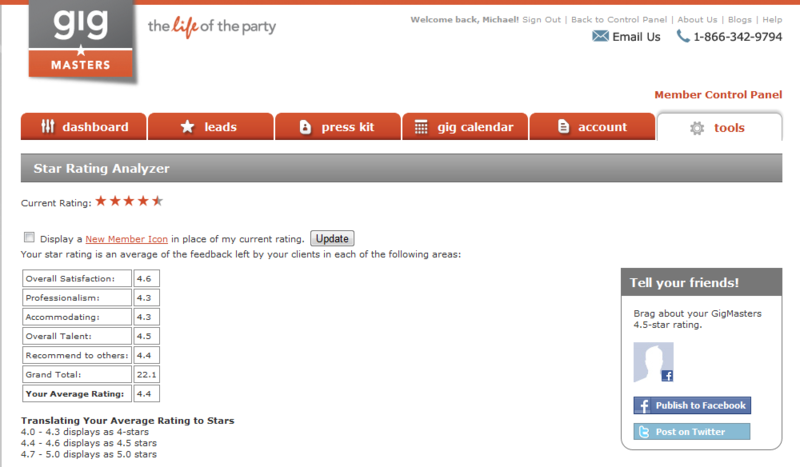 Chances are you probably already know that your star rating is based on feedback from your GigMasters clients. I'll say that again - your star rating is based solely on client reviews! Now that we've (hopefully) cleared that up...on to the next question: How do we calculate your star rating? Every day we recalculate your rating by totaling up your scores in each of the above areas and finding your average score. This translates to your star rating. This page is also useful in that it lets you brag about your rating to your friends on Facebook and Twitter. Next time your rating goes up, why not tell the world? After all, it only takes one great review to push that rating up! Still a little confused about the star rating system? Feel free to contact us or go ahead and ask your question right here in the comment section.